I had arranged our itinerary so that we would go to the Laki crater on this day. We had to go by bus tour because we had no 4×4; we had chosen Laki instead of Landmannalaugur because the bus tour to Laki gives you much more time to walk around and explore. So when I went for my early morning run (and on a family trip that’s not so easy; you have the challenge of going out early without waking anyone else up which is only possible with a flashlight and a nice sized bathroom far removed from the beds.) and summarily got drenched within 5 minutes, my spirits sank. However, as vacation organizer in chief in our family my role is a cheerleader so on return I convinced my wife and son (but not really myself) that it wasn’t too bad outside. After another excellent breakfast (not only did we find the hotel breakfasts big and diverse, they also offer obvious opportunities for packing a lunch to go) we headed to the bus. Like everything we found in Iceland, organization is top quality, maybe made easier by the paucity of people. So when the guidebook says go find the Laki bus in the gas station parking lot, you’re comforted to see there is only 1 gas station and only 2 busses. Although my wife and son managed to get very comfortable on the wrong bus. The trip to Laki is ‘only’ 50 kilometres. Only because it was easily the worst road I’ve ever seen (actually it’s more of a track than a road) and I would never have tried it, even in a 4×4. It takes 2 1/2 hours, through rivers and up hills we’d do well to climb, and is generally so rough that it’s a wonder anyone ever gets there. The bus stops a couple of times on the way, the second time at the appropriately named ‘beautiful falls’ (they are, although Iceland has an incredible number of them) but the day was so dismal, most people on the bus (all 9 of us) ran off and got on again. I could only keep thinking of all those great warm clothes sitting idly in our closets at home. However, by the time we reached the crater, the weather had cleared a little (when I say a little, I mean you could see a patch of blue sky now and then if you really concentrated. It’s all relative.) 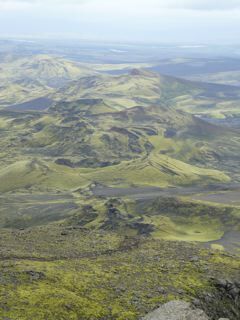 But it was nearly pleasant enough for us to go scampering up to the top of one of the craters from where the view is spectacular. And again, because it is Iceland, you can go walking around forever up there, making sure only to be back at the bus by the time the driver needs to move on. From there we went to a different area, by a lake. Again we hiked around, maybe for an hour and a half on a rough track, taking in a whole array of otherworldly scenery, including the green colored structures we’d seen on day 3. 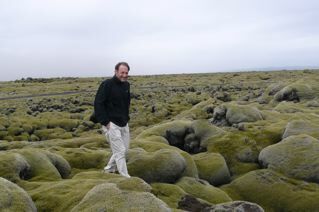 Unfortunately by now we’d discovered this was moss covered lava, and just by touching it you can do it great damage; it seemed we’d set back our area the day before by a few thousand years. Eventually we made it back to the bus, at which point the heavens opened again. 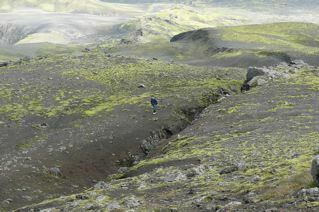 But I would recommend Laki to anyone who wants to take in a day of wild hiking in an incredible place. Back in Kirkjub, we stopped at our new favorite cafe, Systrakaffi, for coffee and hot chocolate, before moving on to our next location, Smyrlabjorg. Day 5 loomed – you guessed it – gloomy. By now we expected that everyday. After another hearty breakfast- our favorite breakfast food now was AB Mjolk, a kind of plain yogurt to which you add brown sugar (but not to be confused with Mjolk, Lettmjolk or G-Mjolk, all forms of milk), we headed off to Jokulsarlon, the glacial lake. We had glimpsed it from the road the evening before. It is an astounding sight, very unusual and not surprisingly has been used at least 3 times for movie scenes (2 James Bond, and Lara Croft Tomb raider). We took the duck type amphibious tour into the lake, and despite the cold and no trace of sun, it was spectacular. It would have been nice to see the icebergs in the sun, but what can you do ? 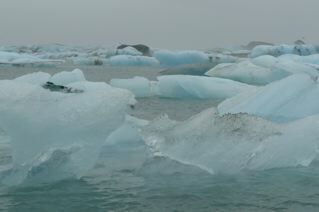 Nevertheless a glacial lagoon covered by 100’s of icebergs is an unforgettable sight. From there we crossed the road and drove to the beach (5 minutes away, don’t miss it). If anything, I thought this was an even better sight. A beach littered with icebergs, icebergs floating from the river to the sea and a great playground for anyone wanting to climb on their own personal iceberg. Eventually we gave in to the cold and headed back to the hotel for hot drinks. 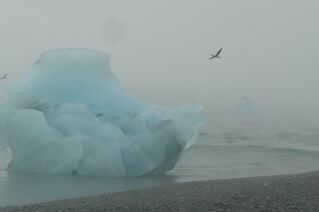 In the afternoon, we headed off to jetski/skidoo up on Vatnajokull, the mighty glacier. Again, organization was terrific. If you over research like me, you’ll be skeptical with an instruction that says ‘pull over on the side of the road and meet us at 2pm.’ But it actually works. Every time. So we pile into a huge 4×4, armed with every bit of clothing we had and head up the mountain. The weather gets worse, even if that doesn’t seem possible. It starts raining, or hailing or snowing. I can’t tell, but at the same time that prevents us from seeing the narrow windy road we’re on and how big the drops are. At the top, we’re relieved to see they’ll provide all the equipment, including gloves, wetsuit and boots. So how wet can you get ? We go out onto the skidoos, sit down, and are almost wet through immediately. We head off in a line of vehicles, a strange scene, but I’m concentrating like crazy just to see. Either the fog gets so heavy I can’t see in front of me or it starts hailing so hard, I can’t see through my glasses. From very early on, this is going to be one of those experiences that’s great , afterwards a really good story, but at the time you just want to get through it. We stop halfway, my son gets a chance to ride, and then we head back. the fog gets worse, I pull over a couple of times to try see anything. They’ve told us to stay on the track because of hidden crevasses and I’m thinking this is one of the least likely places I’d choose to get lost. But we get back, and the relief kind of warms us up. Back at the hotel, we have to ask the hotel to let us use their dryers as everything is soaked. a little later we head off for dinner in the bright lights of Hofn, the closest town around. But it’s Iceland and ‘town’ is not quite what you would imagine. We have excellent soup and bread, drive around the town a couple of times to see if there’s anything of interest – there isn’t,- and head back to the hotel. Tomorrow we’re off to Myvatn – apparently the weather’s set to improve !